We have the great pleasure of sharing our newly published report, which we hope will contribute to increased understanding and knowledge about recovery from eating disorders in a service user perspective. 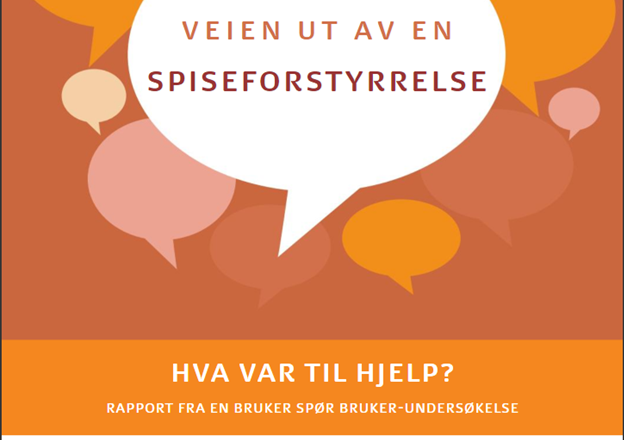 Competence center for lived experience and service development (KBT), ROS – Rådgivning om spiseforstyrrelser [Advice on eating disorders] and UiT/The Arctic University of Norway have conducted a User Interviews User-survey to map what is important for people recovering from eating disorders before, under and after treatment. The target groups for this report are both professionals that treat people with eating disorders, relatives and those suffering from eating disorders themselves. The report consists of three chapters directed to each of the target groups. Each chapter contains recommendations based on feedback from respondents in the survey. Many patients struggle to express their needs in the different phases of their recovery process. Professionals treat patients that differ greatly both in types of eating disorders and types of problems. This report can contribute to a better communication between patients, relatives and professionals, and can be a basis for talking and asking questions to patients. People that suffer from eating disorders and relatives that read the report will not only see that others have recovered from eating disorders, they will also learn what contributed to others recovery. It can give hope and advice on how to recover from a difficult situation. The project is financed by ExtraStiftelsen Helse og Rehabilitering.